The second dish from this fun challenge with Leafcutter Designs threw me for a loop! Start by peeling the cabbage and dropping the leaves into a pot of boiling water to soften them, about 5 minutes. Remove them from the pot and dry with paper towels. In a large skillet, warm oil and brown meat for 10 minutes, remove from skillet and place in a bowl. Now, brown onions, eggplant and mushrooms until eggplant is softened. Once cooked, remove from skillet, place in bowl and mix well. Divide the stuffing into portions for about 8-10 rolls. Place stuffing in center of cabbage leaves and roll like a burrito. Use toothpicks to hold leaves together. 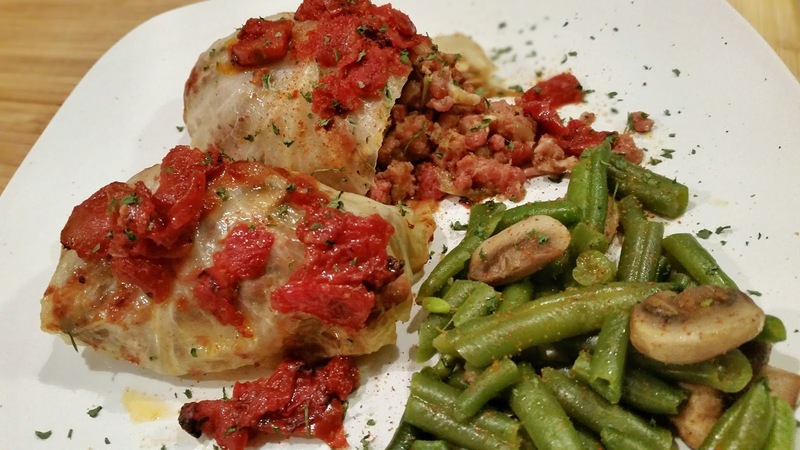 Position cabbage rolls in a baking dish and top with tomatoes. Cover dish and place in oven at 350°F for 1 hour. Once done, remove from oven and serve!